Maybelline Color Sensational Vivids Lipcolor: Brazen Berry A few weeks ago I talked about this same product but in Pink Pop. I love that color so much I wanted to try another color in the same product. Looking at the colors in the tube, it's a little intimidating, but I tell ya, once they're on they are beautiful. I've actually started wearing this color more than Pink Pop, but both of these lip colors have become my go-to lipsticks. One 'n Only Argan Oil: My Mom gave me this product when I went to visit over New Years, and I love it. It smells divine, and it makes my hair super soft all while treating my dry ends. I have to say, and I don't know how it's possible, but I think this oil keeps my hair looking cleaner longer, and I can go more days in between washes than I did before using this product. Plus, a little bit goes a long way so it will last a long time. I love those lipsticks! 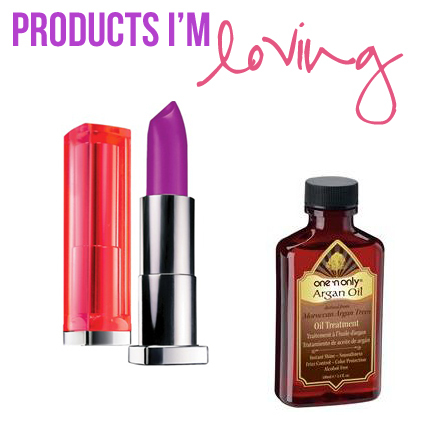 I also love one n only brand argan oil! Their hair color from Sally is amazing also!